That shirt, that hair, that light fixture, that wallpaper! 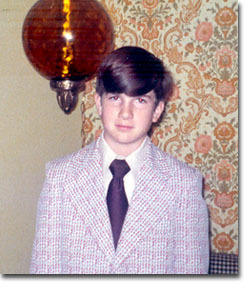 That was me in the 1970’s. Here I sit at age 55 — my birthday is 2/1/61 for you trivia buffs at home — and one of life’s surprises is that I never grew up. At least, not in the way I imagined I would. I’m bigger and older, sure. Not the skinny beanpole I used to be. Now I must carefully trim the hair that grows out of my nose and ears (no one had warned me about that!). But I still like peanut butter and jelly sandwiches. I find that I still care — deeply, foolishly, insanely — about the score of professional baseball games. I mean to say: I care the same way that I cared when I was ten years old. I used to think that we were supposed to “grow out” of those childish things, discard our younger selves like an old pair of jeans. But now I know that people don’t grow that way. I’m still that kid. I am the youngest of seven children. I was born during a snowstorm. I grew up in Wantagh, Long Island. 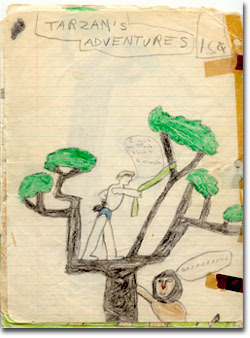 I had four older brothers, two older sisters, and a perfectly satisfactory pair of parents whom I called “Mom” and “Dad.” When I was quite young, with everyone else off to school, I used to draw pictures and make homemade comic books that I sold to friends and neighbors. Was I dreaming of becoming an author? No, absolutely not. I fully intended to play baseball for the New York Mets. But I did enjoy making up stories, creating my own little worlds. In a way, I had my own publishing company, complete with door-to-door product distribution. When you think about it, I pretty much do the same thing today. I’m still making up stories. It’s my job. Those childhood years were important to me. And I bet they are pretty important to you, too. I don’t think of children as unfinished products, like minor league baseball players hoping to get to the “big leagues” of adulthood. Somehow we’re all the same, young and old alike; or, I guess, we’re just not nearly as different as some folks pretend. I still remember being a kid. I still feel those feelings. And it’s not like I’m looking back on fifty years on the planet and watching what happened to some other person. That was me, the same “me” that I am today. When I write books for children, I often call upon those childhood memories, those feelings, that person I (once) was. And what I discover is that he’s always there, whispering in my ear, that ten-year-old kid. Still me. I think the greatest gift of my writing life for children has been that it’s forced me to reflect deeply on my own childhood, and the people who were important to me in those years. The older you get, the more memory fills you up; there’s more past than future; and now I look back with newfound appreciation and humility. I’ve been a lucky guy. Here’s a sample of my early work. Notice that I wrote the numbers backwards, and taped the book on the wrong side. I guess I’m just a lefty from Long Island after all! Since then, I have been fortunate enough to publish a variety books, ranging from movie adaptations to Hello Readers, nonfiction books about sports and animals, even a book for teachers. I have written under various pen names, including Mitzy Kafka, James Patrick, and Izzy Bonkers. I have even been a ghost writer for other people who were too busy to write their own books! 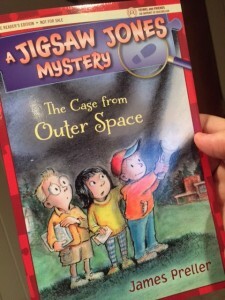 I’m probably best known for writing the “Jigsaw Jones” mystery series. Or, at least, those are the books that brought me some recognition as an author. I love those characters, their kindness and decency, with and charm. Good tales, well told, I’d say. But I’ve also been busy with a number of other projects. Six Innings came out in March, 2008, and I’m proud of it. It’s published by Feiwel & Friends, in hardcover, and the whole process was a great experience for me. I was thrilled when it was named an ALA Notable Book; finally, after all these years, to see librarians and reviewers take notice of my work. I’ll never forget who my real readers are, but it’s always nice when an adult approved, too. Along Came Spider (Scholastic) came out that same year and was named to the New York Public Library’s list of “100 Books for Reading and Sharing.” Like Six Innings, it deals with friendship under duress. And, hey, isn’t it always? The Spring of 2009 saw the publication of a hardcover picture book, Mighty Casey, again with Feiwel & Friends; it’s a twist on the classic poem, “Casey At the Bat,” featuring the hilarious artwork of Matthew Cordell. Both Spider and Casey have subsequently gone out of print. That’s the publishing world these days. If it doesn’t sell big right away, it goes away. These truths are hard for an author. But like everyone, we have to face that rejection and move forward, still believing in ourselves. Not always easy! Bystander (Feiwel and Friends) came out in Fall, 2009. It’s an important book for me, as it deals with bullying in a Middle School. Hopefully readers will find it tense and exciting and see their world realistically conveyed. It was named a 2009 Junior Library Guild Selection and earned many favorable reviews, including this starred review from School Library Journal: “Preller has perfectly nailed the middle school milieu, and his characters are well developed with authentic voices. The novel has a parablelike quality, steeped in a moral lesson, yet not ploddingly didactic. The action moves quickly, keeping readers engaged. The ending is realistic: there’s no strong resolution, no punishment or forgiveness. Focusing on the large majority of young people who stand by mutely and complicitly, ithis must-read book is a great discussion starter.” This book has brought me into many middle schools across the country, and it’s been a profound honor (and responsibility) to talk to sophisticated students not only about my life as a writer, but also about issues of compassion, and empathy, and kindness. In 2010, we saw the publication of two new hardcover books. First out, there’s A Pirate’s Guide to First Grade, a picture book. The illustrations are by Greg Ruth and he is a big-time talent. Kirkus Reviews called it “good fun, me hearties!” and I agree. I had to study up on talking like a pirate to write that one. In August, Scholastic published Justin Fisher Declares War!, a middle-grade book (ages 8-12) that is set in the same school as Along Came Spider. It brought back some of the same characters in minor roles, while shifting the focus to entirely new ones. It’s the same world, it’s just gotten a little bigger. This light-hearted, humorous tale should be an easy, breezy read. It was my first book after Bystander, so I was looking for something gentler, simpler, and funnier. My first true Young Adult novel, Before You Go, was published in July, 2012. (Be careful, it might set the world on fire — or not! It’s hard to say.) The book is set on Long Island — with many scenes at Jones Beach — and features 16-year-old characters. It’s been a very happy, rewarding writing experience. I took my time on it, because sometimes you simply need to write the book you need to write. On July, 2012, I published the first book in my SCARY TALES Series. My inspiration was the old “Twilight Zone” TV series. Different settings, characters, even genre, all somehow unified by a tone and the delivery of the promise: You’ll get something a little weird, with varying degrees of creepy, and always with a twist. I love these books. The first book in the series, Home Sweet Horror, won a 2013 Cybil Award in the category of early chapter books. There are six titles in all. What else? In the summer of ’13 came A Pirates Guide to Recess, the sequel to A Pirate’s Guide to First Grade, both illustrated by the incredible, spectacular Greg Ruth. 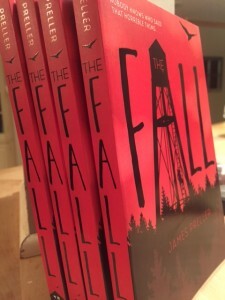 Early in 2014, I handed in a manuscript to The Fall, a book which I consider to be a companion to Bystander. It deals with many of the same issues. The concept for the book is that it’s written in the first-person, a boy who has been engaged in some cyber-bullying is writing in his journal, recounting the traumatic events of the past year or so. 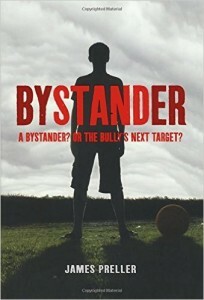 If you liked Bystander, this is the book for you. 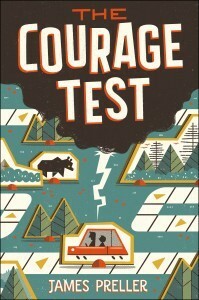 2016 saw the publication of The Courage Test. It was named a 2016 Junior Library Guild Selection, ties directly into the Lewis & Clark Trail, and has earned many favorable reviews, including this starred review from Booklist. Last in 2016, I handed in a revised manuscript for a wild, environmentally-concerned book (set in the near future!) that I first started writing in 2010, titled Better Off Undead. It begins with a 13-year-old boy, Adrian Lazarus, who becomes a zombie and, there being not much else to do, goes off to middle school. I see him as the ultimate misfit. And from there, the book slowly gets weirder, with tons of social commentary and satire. This book should see the light of day in 2017. Perhaps most exciting of all, 2017 will see the publication of a brand-new Jigsaw Jones book, The Case from Outer Space, and the reprinting of four previously out-of-print titles, now with Macmillan: The Case of the Mummy Mystery, The Case of the Bicycle Bandit, The Case of the Smelly Sneaker, and The Case of the Glow-in-the-Dark Ghost. I’m so pleased to see these books back in print — and hopefully in the hands of a new generation of readers. In the meantime, I still live in good old Delmar, New York (near Albany), with my wife, Lisa, and two children: Gavin and Maggie. Our oldest, Nick, now lives and works in downtown Albany. We have two cats and a golden doodle named Daisy. And that, dear readers, is entirely far too much about me! Hi, Lily. I live in Delmar, NY. I think it will be a long drive for me — and I’m looking forward to it! My name is Arthur M. Preller. I saw your message re AJ Preller you wrote recently. AJ is my son. My father was Arthur G. Preller. His brothers were Charles, and Ivo. His moms name was Christine, and I think his fathers name was Ivo. Many many years ago my father told me he had a relative who was a politician in Queens. I am sure it had to be your grandfather Fred. I worked many years as an outside claim adjuster in the insurance business. I drove all over Long Island the city, including Queens. I recall driving on Hillside Ave. and I saw the back stop on a little league field which had a sign on it. I can only recall it said Preller Field. I bet this complex was named after your grandfather. I can also recall attending a conference regarding insurance. Everyone wore name tags. I was approached by a man who told me we had to be related. He had seen my last name on my name tag, and then I saw his name Preller on his tag. He said we had to be related somehow as Preller is not a common name. I think he said his first name was Alan. Somehow I guess we are all related. In addition to the name, faded memories of family, for me that is, and fact the sport we share an interest in, in different ways perhaps, is baseball. I google AJ a lot, and that is where I saw your name in the same subject category. Thus this note. My e mail is apreller11746@yahoo.com. I cannot be sure you will see this, but I wanted to try to communicate to you that we may be family. Thanks for extending your wishes of good luck to AJ. We are all anxious for the 2015 season to start and follow the Padres. Hi James , I write from Barcelona ( Spain) my 8 year old son has read the book ‘ the missing hamster ” and liked it a lot. You have to explain to the class your book , your life and convince their peers who read it. We need specific information on How many books have you written? Sorry, I don’t have a specific number. There are 40 Jigsaw Jones books in all; I usually say “more than 80.” A lot of things went out of print, etc. Thanks for your support! once you coming to Barcelona to sign books? day April 23 is the Day of “Sant Jordi” in Catalonia. Roses and books are given away and there are many writers signing their books . 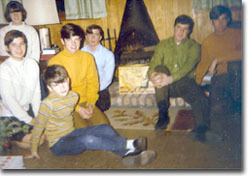 I Think my ex (Ken Kelly know to most as Kelly) & I were friends of your brother Bill, back in the early 1980’s in Wantagh. I wish that your books were around when my son was growing up, he is a teacher now, he actually teaches in a Capital Region District. I will have to ask him if he knows about your books. If you have contact with Bill please give him my regards, Carol Smedley, you can also give him my email if he wants to contact me. Thanks for reaching out, Carol. I will pass along the info! Hi! My name is Olivia Penny. I am a third grader at St. Anselm School in Chesterland, Ohio. I just turned 9 on January 3rd! My class is doing an author study for class. I chose you to study. I’m excited to do this! I like your books. I’m going to read these books: Hemry, the Missing Hamster, The Case of the Best Pet Ever, The Case of the Christmas Snowman. This letter is for school, please write back! Thank you! Olivia, thanks for your comment. My email is jamespreller@aol.com for any correspondence. Please direct any letters to there, since this blog isn’t really the best place for that kind of thing. Oh, and yes, thanks for choosing me for your author study. That’s amazing! I like how you gave good details of your life and your stories and when they came out. I liked reading your Biography! I thought it was very interesting to read! I learned that you had 6 siblings! Wow! I also learned you had 3 kids, how old are they? Maya was an average high school kid. Friends, family, but no luck at all. When the people of her town start getting hypnotised by somthing or someone, itś up to Maya and her worst enemy, Terrance, to find out what or whoś behind it. Will Maya and Terrance be able to save the town or will they be to late? The best way to contact me is via my email, at Jamespreller@aol.com. This blog comments section is not really designed for that kind of personal back-and-forth. And, also, WOW! Keep up all that writing. Hello and I want you to keep being a great author because you are the author i ever heard of and just keep up the good work.